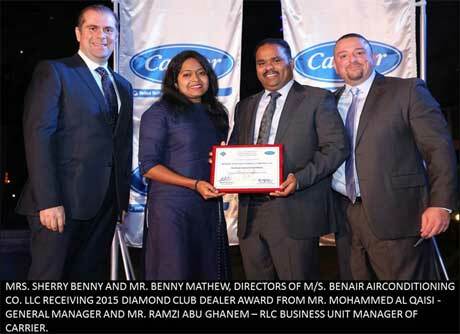 Benair Airconditioning Co.L.L.C Dubai it all began when a young aspiring lawyer motivated by his business clients thought about doing business instead of adhering to his legal profession. It was in 1998 while he came to Dubai though initially he started his legal career but gradually he followed his long time passion of being a business person. While at Dubai he didn’t have to think twice about the services he would have to offer to his clients, it was quite obvious for him to think about cooling people and alleviating them from the scorching heat wave of the dessert. The straw-hat of 1999 was quite welcoming for its clients since Benair became their solace. 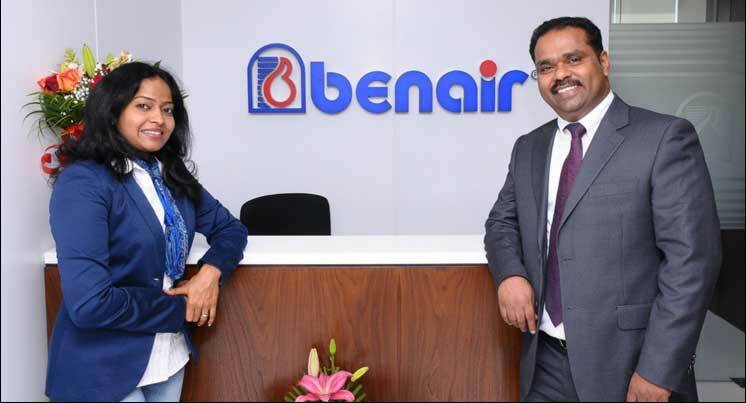 Since the inception of Benair Air-conditioning Co L.L.C in 1999, it has an unswerving progression and transformation, which has proved to be the result of its customer delight. When many entrepreneurs are struggling to find their ways through tough times and chaos, Benair’s strategic directions and its accomplishments are clear. Its management targets are to assure quality. The pursuit of excellence is to serve the customer. The company has been awarded the top dealer position for 2013 by Carrier Air conditioners and Platinum Dealer position by Daikin Air conditioners and number of other accolades to its credit. 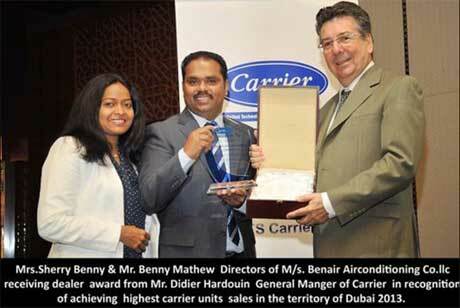 Today Benair Airconditioning Co.L.L.C has branches in Dubai, Sharjah, Abu Dhabi, Saudi Arabia and Kerala, India. The Company’s mission is to ensure maximum customer contentment simultaneously granting the future generation an enhanced abode adhering to the environmental friendly practices. Apart from dealing its own brand, Benair is the authorized dealer of Carrier and Daikin air conditioners. Also it has collaborated with LG, O General, Rheem, York, Mitsubishi and SKM in order to meet the various projects as per customer requirements. Benair caters complete HVAC Solutions for Commercial, Residential, Industrial and Marine projects. Benair maintains dedicated divisions like project contracting, duct manufacturing, maintenance and trading divisions to undertake complete HVAC requirements with great precision and perfection. Emanated as an air-conditioning contracting company since 1999, Benair has Dealership Agreement with Carrier, Daikin, Rheem, LG, and O- General and all leading airconditioning brands. Since its inception Contracting Co undertakes the design, supply, installation, commissioning and maintenance of various turnkey A/C projects for multi storey commercial, Industrial, residential buildings and villas. Benair executes the projects with all leading brands Air conditioners as per the client requests in a best cost effective way. The company has already completed more than 1400 projects in UAE. Benair has a well-established maintenance division with fully equipped service team 24/7, supervised with service engineers and experienced technicians. Benair undertakes maintenance for all kind of air conditioning projects and having maintenance contracts with number of potential clients including DHL, Nakheel etc. This division deals with both Pre-Insulated and Galvanized Iron Ducts. It maintains factory at Al Qouz Industrial area with mechanized modern facilities to cater any type of ducting and fabrication work. The Company is having a fully equipped duct fabrication unit located in Dubai which manufactures GI or pre insulated ducts under the supervision of qualified and experienced staff to meet any kind of large or small project requirement within the given time frame. Born to Pulickakara Mathew, an agriculturist and Annamma Mathew, Benny Mathew graduated from Calicut University in Bachelor of Arts and further studied his LLB from Government Law College, Bombay. The commitment towards his community has urged him to strive persistently thereby contributing towards its progression. A philanthropist who always care for less privileged in the society, he has also designed a charity foundation named as Benny n Sherrys foundation which actively take care of the needs of the depressed. 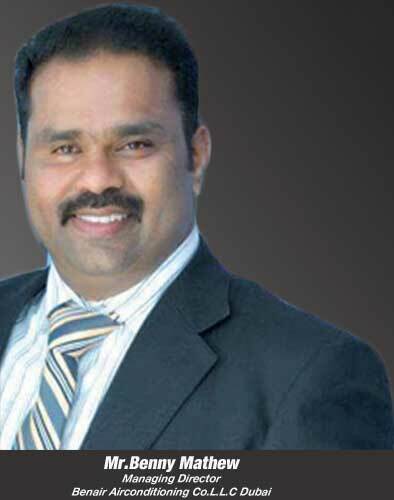 Also an active member and vice president of the Syro Malabar Community. He also hold the directorship of Rashtra Deepika Ltd. which is probably the oldest Malayalam Daily. His life partner Mrs. Sherry Benny who actively supports him in all his endeavours also a law graduate from Government Law College Ernakulam. She has also acquired her Masters in International Business Management from Heriot watt University Scotland.